This project describes the design, implementation and evaluation of a hot air balloon data acquisition system(DAQ). The project is done in collaboration with Toradex AG, providing the main computer unit of the system, colibri T20 ARM module. Globo-daq collects data on positioning, environmental conditions and live pictures during the hot air balloon flight. We use a multi-GNSS module, composed of two GNSS systems, , to achieve high precision positioning. We adopted a Model Driven Design (MDD). The goal of this project is to design, implement, and evaluate in terms of dependability and performance a data acquisition system for hot air balloons, using the Colibri t20 module as MCU, who will receive, process, transmit and save the information from different sources such as sensor, camera and GNSS. Obtain the information from the GPS (latitude, longitude and altitude), process and record it, to evaluate the location followed by a 3D tracking. Obtain the information from the sensors( e.g. barometric pressure / temperature / r.H) process and record it. Obtain pictures from the camera, process and record it. Provide a live data from the system to a server using GSM/GPRS. Check a live track data on map, picture overlays on map, through a website. Check a recorded track data on map / pictures, diagrams, e.g. speed vs. time, through a website. The design contain three parts, namely Navigation Module, Offline Data Storage Module, GUI/Data Module, all of them based on the core of the system, a Computer Module, who receive the user inputs and process the data output of the different modules. This module performs the data acquisition, processing and delivery of the tracking, location, images and other services of Globodaq. The computer module that will be used is Colibri T20, which will the core of the system based on a NVIDIA Tegra 2, ARM Cortex – A, mounted on an Iris Carrier Board, which will supply all the peripheral connections , Toradex Products. More info please visits http://www.toradex.com/products/colibri-arm-computer-modules. The whole electronic will be mounted in a case with a protection of at least IP 64. The power supply will be through a battery which is mounted inside the case. It shall be possible to charge the battery with a connector on the case. Sensors: Will be used a set of sensor to perform the measure of Humidity, Atmospheric Pressure, Temperature. The candidates suggested are the Oak Humidity and Oak Atmospheric sensors. Camera: Will be used a standard USB webcam, with an easy holder mount. It will be remotely controlled for different positions / angles. The main module (Colibri T20) will acquire pictures, add time/location to the EXIF data and store the pictures on the micro SD card. The pictures will be transmit over the online connection and display them in the web application. This module is used to storage all produced files, tracks or photos are on a micro SD card on the computer module (Iris Board), allowing easy access to the data offline. The purpose of this module is storage the data received from the computer module, and perform a GUI to show all the data obtain from the navigation module in a friendly way for the user, through a website will several features to present data nicely. E.g follows the flights on Google maps, plot of the different weather variables during the fly. As add on will be implement a mobile app where the user can find several details related with the flight, such as, location, weather conditions, etc. This module is the main interface between the whole system and its development. The basic Globo-Daq HMI will consist of a power button/switch and the LEDs on the Iris to show if power is on or off. The DVI connector on the Iris will be accessible for development or service. The debug UART & USB client connector on the Iris will be accessible for development or service. This may only be possible when the case is open but it should not be necessary to disassemble everything. Globodaq will be developed by stages; all of them are based and related with the Computer module as is explained above. 1. Navigation Module part 1. Evaluation and characterization of the sensor, Gps and Camera. Gps Tracking SW, data acquisition, process, analyze, output to storage and GUI. Sensor SW, data acquisition, process, analyze, output to storage and GUI. Design the additional HW needed for the further stages. Addition of a mobile internet connection, GSM/GPRS to the computer module. Develop a connection between the computer module and Data base server, to storage the data. An evaluation of different web and mobile applications already available, the selection depends how it fits with the platform and infrastructure used. Design and/or integration of web and mobile application to the system. Storage the data output from the Computer Module, based on a certain interval, to preserve the data for offline cases. Addition of the camera to the system, to perform live pictures during the flights. Characterization and evaluation of the power consumption of each component of Globo-Daq system. Analyses of key points where lower power consumption can be achieve. Implementation of different techniques to fetch lower power consumption. Selection and dimension of the battery, in terms of flight time vs. performance. Implementation of a mechanical structure to carry and protect the Computer Module. Evaluation and implementation on–site the hot air balloon of the sensors, Gps Antenna and camera. Integration on-site the hot air balloon of each module. 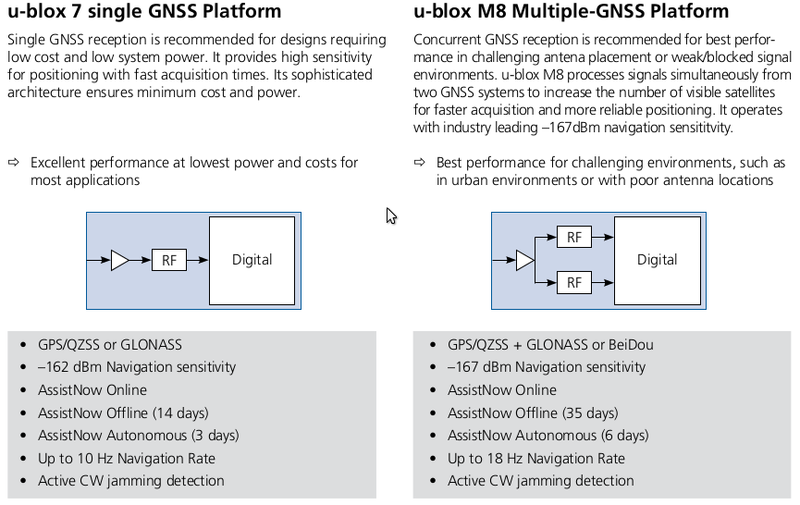 After an extensive search for different modules (comparisons, GPS guides, review of several users) , we choose U-blox(http://www.u-blox.com/) products, Swiss global-leader company in cellular and positioning semiconductors. There are plenty of system design - development methodologies in the industry and academic field, in this chapter is presented a short and abstract description of the methodology adopted for the project development. Before we continue with the project development is necessary to introduce everyone to the basic aspects related with a hot air balloon and data acquisition systems (DAQ). In this chapter is presented the selection process for the following components: •	Internet Connectivity module (modem, router, antenna). •	Sensors. •	Camera. This update shows how to get data in the computer module Colibri T20 from the GNSS receiver through the UART interface, print it into the console and later save it into a file. It is necessary to introduce some basic concepts regarding to GNSS principles and systems, satellite navigation basics and different data format (navigation) related with the project implementation. The barometric pressure sensor selected for our system is the MS5611-01-BA-03 from Measurement Specialties. For more information about the sensor please review out previous updates. The temperature and humidity sensor selected for our project is the SHT25 from SENSIRION. In this update we will cover its description and implementation within our system. In case that somebody else is interesting. We will present a “how-to” of a successful case of 4G connection for your TORADEX module!! !.